CHARLOTTETOWN, PEI -- Families are encouraged to take time to read with their children on Family Literacy Day and every day throughout the year, says Education and Early Childhood Development Minister Alan McIsaac. Minister McIsaac joined the PEI Literacy Alliance in officially proclaiming January 27, 2014, as Family Literacy Day in Prince Edward Island. This national celebration takes place annually to encourage families to participate in literacy activities together. The theme for Family Literacy Day celebrations is 15 Minutes of Fun. Reading and learning together for just 15 minutes a day provides great benefits for children and parents. • Write a joke book with your family. • Read a bedtime story to the grown-up putting you to bed. • Make up a new recipe together and post it online. • Tell knock-knock jokes together while doing the dishes. • Organize a book swap at your school. • Make up riddles and tell them to your friends. • Create a family book club. • Build a drum with your family. • Surf the Internet and learn about your favourite animal. • Make up a song about your day to sing to your family at dinnertime. • Write messages to your family on sticky notes and post them around the house. • Create a story about what you’ll be doing for Family Literacy Day. • Play a board game together. • Build an acrostic poem using your hero’s name. • Make an origami boat and see if it will float. For more details on Family Literacy activities, please visit the PEI Literacy Alliance website at www.pei.literacy.ca or the national website at www.abclifeliteracy.ca. For more information on the PEI Public Library Service, visit www.library.pe.ca. Teacher Appreciation Week is fast approaching, coming up the week of February 10-14th! Our committee co-chairs are Darlene Howatt and Lori Ferguson-Brown. There will be treats daily for the teachers/staff and a lunch on Thursday, February 13th (storm date is Friday the 14th). Please contact Darlene or Lori if you would like to help. They will be making calls the first week of February for food preparation, door prizes, kitchen help and class coverage. Thank you to everyone in advance for helping out with this important annual event! 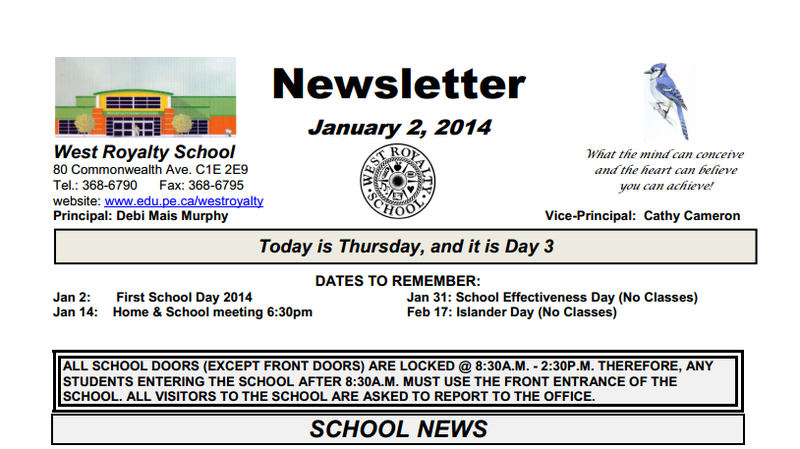 The West Royalty School Newsletter has been posted to the school website. CLICK HERE for the January Newsletter.